Biologists with the Florida Fish and Wildlife Conservation Commission's (FWC) Fish and Wildlife Research Institute and Mote Marine Laboratory ask anglers to gather valuable information for the Tarpon Genetic Recapture Study. 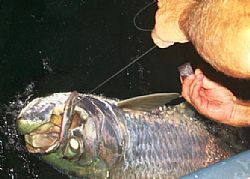 Participating anglers collect DNA samples from any tarpon of any size. These samples help biologists gain insight into tarpon movement and distribution. Biologists use DNA samples to identify the tarpon's genetic "fingerprint." The fingerprints provide a unique and natural tag for each individual fish. Scientists compare new tarpon DNA samples with cataloged samples to determine if someone else caught and sampled that tarpon previously. Biologists refer to these fish as "recaptured" tarpon. In 2010, anglers provided biologists with more than 3,100 tarpon DNA samples. With more samples to be processed, biologists have documented 71 recaptured tarpon since the study began in 2005. Current data indicates that approximately one out of every 100 sampled tarpon is a recaptured fish. Angler involvement has increased significantly each year of the study. Biologists hope that more anglers will join the effort, providing even more data for the study. So far in 2011, anglers have provided hundreds of samples, bringing the total number to just over 9,000. Anglers throughout Florida submitted samples from tarpon ranging in length from 5 to 96 inches. Anglers who would like to assist the study may obtain a free, easy-to-use tarpon DNA sampling kit by emailing TarponGenetics@MyFWC.com or by calling 800-367-4461. Participating anglers receive an annual newsletter with updates on the study. As it becomes available, anglers also receive additional information about recaptured tarpon. Anglers who submit a tarpon DNA sample to this study in 2011 will be entered into random, bi-monthly drawings for various prizes.